Background Patients with symptoms of possible colorectal cancer are not always referred for investigation. Aim To ascertain barriers and facilitators to GP referral of patients meeting the National Institute for Health and Care Excellence (NICE) guidelines for urgent referral for suspected colorectal cancer. Design & setting Qualitative study in the context of a feasibility study using information technology in GP practices to flag-up patients meeting urgent referral criteria for colorectal cancer. Method Semi-structured interview with 18 GPs and 12 practice managers, focusing on early detection of colorectal cancer, issues in the use of information technology to identify patients and GP referral of these patients for further investigation were audiotaped, transcribed verbatim, and analysed according to emergent themes. Results There were two main themes: wide variation in willingness to refer and uncertainty about whether to refer; and barriers to referral. Three key messages emerged: there was a desire to avoid over-referral, lack of knowledge of guidelines, and the use of individually-derived decision rules for further investigation or referral of symptoms. Some GPs were unaware that iron deficiency anaemia or persistent diarrhoea are urgent referral criteria. Alternatives to urgent referral included undertaking no investigations, trials of iron therapy, use of faecal occult blood tests (FOBt) and non-urgent referral. In minority ethnic groups (South Asians) anaemia was often accepted as normal. Concerns about over-referral were linked to financial pressures and perceived criticism by healthcare commissioners, and a reluctance to scare patients by discussing suspected cancer. Conclusion GPs’ lack of awareness of referral guidelines and concerns about over-referral are barriers to early diagnosis of colorectal cancer. UK mortality rates from colorectal cancer remain higher than in comparable countries and patients with symptoms are not always referred for investigation. This study found GPs who were reluctant to refer patients who met urgent referral criteria. Their reasons included poor knowledge of urgent referral criteria, lack of suspicion of common symptoms such as iron deficiency anaemia, pressure to reduce referrals, and a desire to avoid scaring patients. This reluctance to refer hinders early detection. In the UK, survival after diagnosis of colorectal cancer has been observed to be poorer than in other countries, partly due to diagnosis and treatment at a later stage.1–4 For one-quarter of patients in 2007–2008, time between meeting NICE 2005 referral criteria5 and diagnosis was over 6 months.6,7 Annual incidence of colorectal cancer is 66 per 100 000 population, so a full-time GP will expect to see only one case per year.8,9 This relative unfamiliarity, coupled with the many possible symptoms makes it difficult to decide which patients to refer for diagnostic investigation. The CREDIBLE study investigated the feasibility of using electronic patient records to flag up patients aged 60–79 years with symptoms meeting NICE urgent referral criteria for investigation of suspected colorectal cancer. These can be thought of as red flag symptoms or warning signs. They include iron deficiency anaemia, persistent diarrhoea, rectal bleeding (NICE 2005 urgent referral criteria for colorectal cancer)5 or positive FOBt. The previously published quantitative outcomes of the CREDIBLE study10 found considerable variation in diagnostic and referral action undertaken by GPs for patients flagged up as meeting contemporary NICE urgent referral criteria. Many patients with uninvestigated red flag symptoms were considered by their doctor as not needing further investigation. As part of the CREDIBLE study10 the authors also undertook qualitative research exploring attitudinal and contextual influences on investigation and referral of patients to secondary care through interviews with general practice staff. This study, which focuses on individual GP-level or GP practice-level barriers to GP referral of patients specifically meeting NICE urgent referral criteria for colorectal cancer, is one of the few to examine barriers to referring patients for suspected colorectal cancer. The lead GPs and practice managers in all 22 practices participating in the CREDIBLE study10 were invited for interview. It was important to conduct a joint interview to develop a deeper understanding of barriers and facilitators at both the individual GP level and the practice level. The practice manager provided context from the perspective of practice organisation. Data were collected between January and June 2014, towards the end of the study, through face-to-face semi-structured interviews lasting a median of 39 minutes (range 25–﻿66 minutes). Participants received an information sheet ahead of interview, provided informed consent and the interview was recorded on audiotape. Interviews took place at the GP surgery, apart from one at the University of Birmingham, and were conducted by two non-clinical health researchers. One was an experienced qualitative researcher and the other had more in-depth knowledge of the practices resulting from working on the CREDIBLE study. One interview was carried out by one researcher alone. The original topic guide focused on views about the use of software to flag up patients meeting urgent referral criteria for colorectal cancer. However in light of varied responses to dealing with flagged up patients, interview schedules were adapted iteratively11 to explore reasons for not referring patients with documented referral symptoms, or for relying on FOBts (Box 1, Section 3). One researcher led the interview, while the other focused on section 3 of the interview schedule after auditing which symptoms had been followed up in practice. Recorded interviews were transcribed verbatim, and checked for accuracy at least twice. One interviewee gave permission for written notes but not audiotaping. In this case, the researchers independently wrote up the interview and compared notes for accuracy. The data were analysed thematically, searching for GP text relating to referral and investigation at GP, patient, practice, secondary care, and NHS systems level.12 Frequent triangulation within the multidisciplinary team ensured thorough and consistent coding. This study presents data relating to investigation and referral solely from the GP perspective. Eighteen of the 22 practices participated and 18 interviews were conducted with 18 GPs, including partners, senior partners, salaried GPs, and locums, and 12 non-clinical staff (11 practice managers and one information technology manager) across those 18 general practices. No-one was available for interview in four practices: two declined, one was unable to participate because of time commitments, and in one both the GP and practice manager involved in the original study had left. Participating practices served predominantly deprived areas in the urban West Midlands of England, with registered populations between 2000 and 27 000 patients, some with high proportions from minority ethnic groups. Organisational structures varied from single-handed to partnership-held to nurse/practice manager consortia. Both teaching and non-teaching practices participated. Table 1 shows the practice characteristics, including those who did not participate in interviews. This study presents evidence on barriers to referral at individual GP and practice levels. A wide variation in referral of symptoms and uncertainty about whether to refer was found. Initial coding revealed that referral and investigation appeared to be greatly influenced by the GPs’ beliefs and attitudes about which symptoms should be referred. Two major themes were identified: variation in referral of symptoms and uncertainty about whether to refer; and barriers to referral. Each of these had a range of sub-categories which are discussed below. While some GPs closely followed guidelines5,13 there were examples of deviations for almost every referral criterion (Box 2). Descriptions of clinical practice were often prefaced by 'we' indicating that other colleagues followed the same practice. When given examples of non-referral found in practice, GPs elaborated on personal decision-making processes, including detailed history taking and looking for additional evidence before referring; for example, history, examination, or investigations that would raise their suspicion of cancer. With strong suspicions, all GPs said they would refer via the 2-week wait pathway or more quickly and on three occasions, same-day referral by GPs was mentioned. Although iron deficiency anaemia in an adult aged >60 years is one of the criteria for urgent referral, it was not universally perceived as a strong indication for referral and in the absence of additional symptoms such as rectal bleeding, bowel problems, or weight loss, colorectal cancer was often not considered (Box 2 quote 1). Four general practices cited the use of FOBt to help decide whether to refer, while others looked for weight loss in addition to anaemia. Some GPs would prescribe iron supplements for anaemic older patients and monitor symptoms. Some GPs indicated that referral for persistent diarrhoea was more likely when accompanied by additional symptoms such as weight loss (Box 2 quote 2). There was variation in carrying out rectal examinations, with mention of colorectal cancer diagnosed in patients with rectal bleeding attributed to haemorrhoids (Box 2 quote 4). Four key barriers to referral were identified by GPs. There was also uncertainty about whether or not to use the '2-week wait' pathway, whether to refer directly to colorectal surgeons or to gastroenterology and, in the case of anaemia, whether to refer first for lower or upper gastrointestinal investigation. In the CREDIBLE study software was used to search electronic patient records to generate a list of patients aged 60–79 years meeting contemporary NICE urgent referral criteria: persistent diarrhoea, iron deficiency anaemia, rectal bleeding, or positive FOBt.10 These data indicate that GPs in the current study were often reluctant to refer these patients for a variety of reasons. They were aware of pressure to avoid over-referral and wished to avoid being identified as having a high referral rate. Some GPs considered that referral would scare patients and weighed this against a low perceived risk of cancer. Before referring, some GPs therefore required additional evidence: their own suspicion of cancer, or clinical features such as weight loss, positive FOBt results, or bowel symptoms. NICE red flag symptoms alone were not regarded as sufficient. Anaemia was often perceived as common and therefore not always warranting investigation. Because of lack of familiarity with referral guidelines, some GPs used personally devised decision rules and diagnostic strategies which hindered further investigation. From these data it appeared that two groups of patients may be at greater risk of non-referral: minority ethnic groups with anaemia, because this is attributed to diet, and patients with anxiety issues, which could be exacerbated. The interval between the onset of symptoms and eventual diagnosis is affected by the patient, GP, secondary care clinician, and the healthcare system.14 This study focused only on the interval between first presentation to primary care and first referral to secondary care. Interviews may be subject to social desirability bias,15 but GPs were confident in describing referral practice which went against NICE guidelines. Interview findings were corroborated by triangulation with data from the same general practices showing non-referral and long diagnostic delays in patients with anaemia and diarrhoea.10 These findings are also consistent with the shorter diagnostic intervals seen in patients presenting with rectal bleeding.16 The 18 GP responders were all from urban general practices serving deprived, multiethnic populations in one region of England. It is not possible to comment on whether we would obtain similar findings from practices serving more affluent populations in other regions. However participating general practices were not homogenous and varied in size and organisational structure. Only half the interviews included both practice managers and GPs but findings were similar from individual and joint interviews. 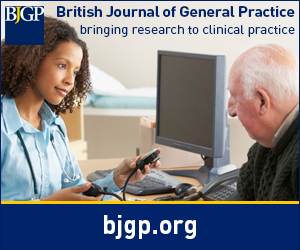 Although this study focused on GP perspectives further analysis of joint interviews with practice managers will be undertaken to provide a broader practice organisational perspective. defining the final diagnosis, with various strategies used at each stage. Clinical guidelines intend patients meeting urgent referral criteria for colorectal cancer should be referred promptly. By lowering the risk threshold, new guidelines aim to increase urgent referrals.27 Lower gastrointestinal endoscopy, with removal of precancerous polyps, reduces mortality from colorectal cancer,39 with protection lasting several years.40 High use of urgent referral (2-week wait) pathways appears to reduce cancer mortalities.23 However GPs’ concerns about alarming patients and perceived external pressures from CCGs to reduce referrals directly undermine this strategy. Patients identified as being at risk of cancer through FOBt screening are routinely referred, without opportunity for GP discretion. Professional autonomy allows GPs to exercise discretion in relation to referral of patients with signs and symptoms but also may conflict with the intention that patients meeting urgent referral criteria are referred. GPs who follow guidance refer earlier than those who pursue a 'personal' or more 'ad hoc' decision-making strategy. Diagnostic strategies used by GPs may hinder referral because referral for investigation of suspected cancer does not require a definitive diagnosis. Due to concerns about over-referral and scaring patients, many GPs are reluctant to refer patients who meet urgent referral criterial for colorectal cancer. Healthcare commissioners should support and encourage GPs to refer patients meeting urgent referral criteria for cancer. Further research could test the belief that anaemia is less predictive of colorectal cancer in minority ethnic groups. Research also is needed to identify the strategies most likely to promote referral. This could include drawing attention to the need to increase referrals, highlighting practices that refer too few patients and making GPs aware that most symptomatic patients prefer to be investigated. Particular attention may be needed on strategies to increase referral thresholds for overly-anxious patients. Having gone through a period of us running the searches at your practice, has it changed any aspect of practice? Has it changed referral thresholds? Made you question current practice? Changed your view of decision support systems? Do you think it this something that should be done as standard practice in primary care? What the advantages of this kind of case finding? What do you think needs to be done to embed this into routine practice? Who would need to do what? Instead of a monthly review of patient records, would you prefer a system that flagged up patients as soon as they met referral criteria? Where do you put early diagnosis of cancer in your list of priorities? What about your colleagues here —﻿ do the other GPs see things differently? Does referring patients for further investigations improve or damage your relationship with them? Are there any times when you’ve been uncertain whether or not to refer for urgent investigation? Can you say what a proper GP should do with regard to early diagnosis of colorectal cancer? How does this CREDIBLE approach support or undermine your sense of being a proper GP? Do you ever have difficulties deciding which consultant to refer to? If you are uncertain about diagnosis, is it better to wait and see or to refer to a specialist? Have you ever been criticised by a consultant when you have made a referral? Is it better to risk annoying a specialist or risk missing a chance to diagnose earlier? Is it better to risk worrying a patient or risk missing a chance to diagnose earlier? If a Faecal Occult Blood test (FOBt) is negative does this influence your decision to refer? What would your reaction be if we said we’d found examples of some GPs who decide not to refer patients with symptoms because they have had a negative FOBt? Would you yourself ever decide not to refer a patient with symptoms if a FOBt was negative? Do you ever use online learning tools? There is a new online learning tool (with CPD accreditation): Suspected lower gastrointestinal tract cancer: when you should refer (http://learning.bmj.com/learning/search-result.html?moduleId=5003316). Would it have helped you assess the lists of our patients we’ve flagged up if we’d been able to point you in its direction before we started the study? How might we best influence other GPs to refer more appropriately? This study was funded by the National Awareness and Early Diagnosis Initiative (NAEDI). Tom Marshall and Sheila Greenfield are partly funded by the National Institute for Health Research (NIHR) through the Collaborations for Leadership in Applied Health Research and Care for the West Midlands (CLAHRC-WM) programme. The views expressed in this publication are not necessarily those of the NIHR, the Department of Health, University of Birmingham, or the CLAHRC-WM. The funders had no role in study design, data collection, and analysis, decision to publish, or preparation of the manuscript. William Hamilton was clinical advisor for the NICE guideline NG12. His contribution to this article is in a personal capacity, and is not to be interpreted as representing the view of the Guideline Development Group, or of NICE itself. Ethical approval was granted by the NHS National Research Ethics Service (Reference 11/WM/0404). We would like to acknowledge: the GPs and practice managers who supported took part in the study and the trial coordinator Marie Crook. We also acknowledge the support of the National Institute for Health Research Clinical Research Network. (2003) Differences in colorectal cancer survival between European and US populations: the importance of sub-site and morphology. Eur J Cancer 39(15):2214–2222, doi:10.1016/S0959-8049(03)00549-5. (2012) Aspects of survival from colorectal cancer in Denmark. Dan Med J 59(4):B4428. (2013) Stage at diagnosis and colorectal cancer survival in six high-income countries: a population-based study of patients diagnosed during 2000-2007. Acta Oncologica 52(5):919–932, doi:10.3109/0284186X.2013.764008. (2015) Is England closing the international gap in cancer survival? Br J Cancer 113(5):848–860, doi:10.1038/bjc.2015.265. (2005) Referral guidelines for suspected cancer CG27 (NICE, London). (2014) Comparison of cancer diagnostic intervals before and after implementation of NICE guidelines: analysis of data from the UK General Practice Research Database. Br J Cancer 110(3):584–592, doi:10.1038/bjc.2013.791. (2014. ) General and Personal Medical Services: England 2003–13. Health and Social Care Information Services . http://www.hscic.gov.uk/catalogue/PUB13849/nhs-staf-2003-2013-gene-prac-rep.pdf. (accessed 11 Aug 2017). (2014) UK Bowel Cancer statistics (Data provided to CRUK on request from the Office for National Statistics (July 2013), ISD Scotland (May 2013), the Welsh Cancer Intelligence and Surveillance Unit (June 2013) and the Northern Ireland Cancer Registry (June 2013). http://www.cancerresearchuk.org/cancer-info/cancerstats/types/bowel/incidence. (accessed 11 Aug 2017). (2014) General and Personal Medical Services: England 2003-13. http://www.hscic.gov.uk/catalogue/PUB13849/nhs-staf-2003-2013-gene-prac-rep.pdf. (accessed 11 Aug 2017). (2015) Preliminary results of a feasibility study of the use of information technology for identification of suspected colorectal cancer in primary care: the CREDIBLE study. Br J Cancer 112:S70–S76, doi:10.1038/bjc.2015.45. (2006) The qualitative research interview. Med Educ 40(4):314–321, doi:10.1111/j.1365-2929.2006.02418.x. (2011) Guidelines for the management of iron deficiency anaemia. Gut 60(10):1309–1316, doi:10.1136/gut.2010.228874. (2012) The Aarhus statement: improving design and reporting of studies on early cancer diagnosis. Br J Cancer 106(7):1262–1267, doi:10.1038/bjc.2012.68. (1985) Methods of coping with social desirability bias: a review. Eur J Soc Psychol 15(3):263–280, doi:10.1002/ejsp.2420150303. (2016) Symptoms and co-morbidities associated with diagnostic interval for colorectal cancer: a prospective cohort study. Eur J Cancer Care 115:533–541. (1993) Delay in the diagnosis and prognosis of carcinoma of the right colon. Br J Surg 80(10):1327–1329, doi:10.1002/bjs.1800801037. (1995) Predictive value of signs and symptoms for colorectal cancer in patients with rectal bleeding in general practice. Fam Pract 12(3):279–286, doi:10.1093/fampra/12.3.279. (2016) International variation in adherence to referral guidelines for suspected cancer: a secondary analysis of survey data. Br J Gen Pract 66(643):e106–e113, doi:10.3399/bjgp16X683449. (2015) Could it be colorectal cancer? General practitioners' use of the faecal occult blood test and decision making--a qualitative study. BMC Fam Prac 16:153, doi:10.1186/s12875-015-0371-1. (2014) Managing risk in cancer presentation, detection and referral: a qualitative study of primary care staff views. BMJ Open 4(6), doi:10.1136/bmjopen-2014-004820. e004820. (2015) Rapid diagnostic pathways for suspected colorectal cancer: views of primary and secondary care clinicians on challenges and their potential solutions. BMJ Open 5(10):e008577, doi:10.1136/bmjopen-2015-008577. (2016) Undergoing diagnostic evaluation for possible cancer affects the health-related quality of life in patients presenting with non-specific symptoms. Plos One 11(2), doi:10.1371/journal.pone.0148463. e0148463. (2014) Decision making and referral from primary care for possible lung and colorectal cancer: a qualitative study of patients' experiences. Br J Gen Pract 64(629):e775–e782, doi:10.3399/bjgp14X682849. (2014) Preferences for cancer investigation: a vignette-based study of primary-care attendees. The Lancet Oncology 15(2):232–240, doi:10.1016/S1470-2045(13)70588-6. (2015) Use of the English urgent referral pathway for suspected cancer and mortality in patients with cancer: cohort study. BMJ 351, doi:10.1136/bmj.h5102. h5102. (2015) Suspected cancer: recognition and referral NG12, Available at:. https://www.nice.org.uk/guidance/ng12. (accessed 7 Sep 2017). (2009) Diagnosis in general practice: Diagnostic straegies used in primary care. BMJ 338(7701):1003–1005, doi:10.1136/bmj.b946. (2013) Cancer suspicion in general practice: the role of symptoms and patient characteristics, and their association with subsequent cancer. Br J Gen Pract 63(614):e627–e635, doi:10.3399/bjgp13X671614. (2014) Predictive values of GPs' suspicion of serious disease: a population-based follow-up study. Br J Gen Pract 64(623):e346–e353, doi:10.3399/bjgp14X680125. (2015) How do general practitioners manage patients with cancer symptoms? A video-vignette study. BMJ Open 5(9):e008525, doi:10.1136/bmjopen-2015-008525. (2014) Cancer suspicion in general practice, urgent referral and time to diagnosis: a population-based GP survey and registry study. BMC Cancer 14:636, doi:10.1186/1471-2407-14-636. (2009) Missed opportunities to initiate endoscopic evaluation for colorectal cancer diagnosis. Am J Gastroen 104(10):2543–2554, doi:10.1038/ajg.2009.324. (2012) Missed opportunities in early diagnosis of symptomatic colorectal cancer. Rev Esp Enferm Dig 104(7):343–349, doi:10.4321/S1130-01082012000700002. (2015) Explaining variation in cancer survival between 11 jurisdictions in the International Cancer Benchmarking Partnership: a primary care vignette survey. BMJ Open 5(5):e007212, doi:10.1136/bmjopen-2014-007212. (2013) Evaluation of risk assessment tools for suspected cancer in general practice: a cohort study. Br J of Pract 63(606):30–36, doi:10.3399/bjgp13X660751. (2014) Using QCancer®-2014 in a clinical setting Document Version 1.0. http://www.qcancer.org/Using-QCancer-2013-in-a-clinical-setting.pdf. (accessed 14 Aug 2017). (2015) Verdict. Is the NHS heading for financial crisis? Available at:. http://www.kingsfund.org.uk/projects/verdict/nhs-heading-financial-crisis. (accessed 14 Aug 2017). (2014) Effect of screening sigmoidoscopy and screening colonoscopy on colorectal cancer incidence and mortality: systematic review and meta-analysis of randomised controlled trials and observational studies. BMJ 348:g2467, doi:10.1136/bmj.g2467. (2011) Protection from colorectal cancer after colonoscopy: a population-based, case-control study. Ann Intern Med 154(1):22–30, doi:10.7326/0003-4819-154-1-201101040-00004.